Who doesn’t love a good chicken curry, especially when it’s cold and miserable outside. Although there’s nothing better than homemade curry paste slow cooked for hours, it’s just not always practical especially when you need to prepare a quick and easy mid week meal for the family. It’s all too easy to reach for a jar of curry sauce but almost all the ready made curry sauces out there are loaded with unnecessary sugar. My solution? 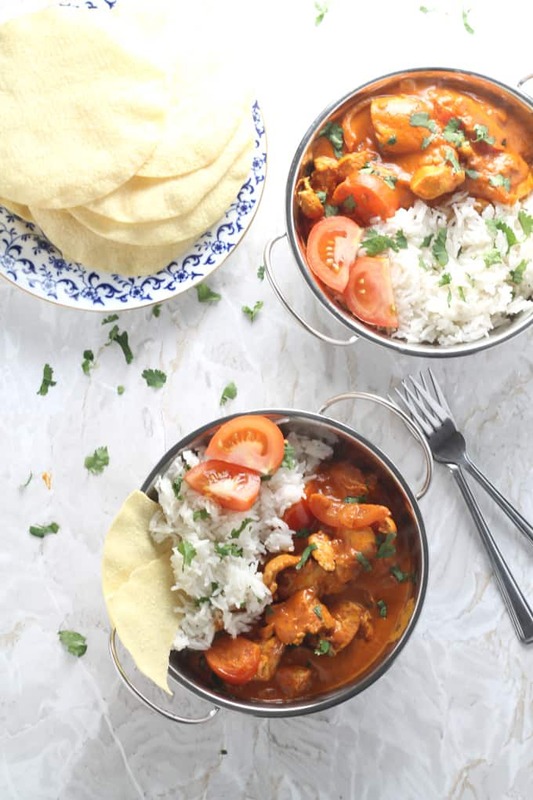 This Chicken, Coconut & Tomato Curry. 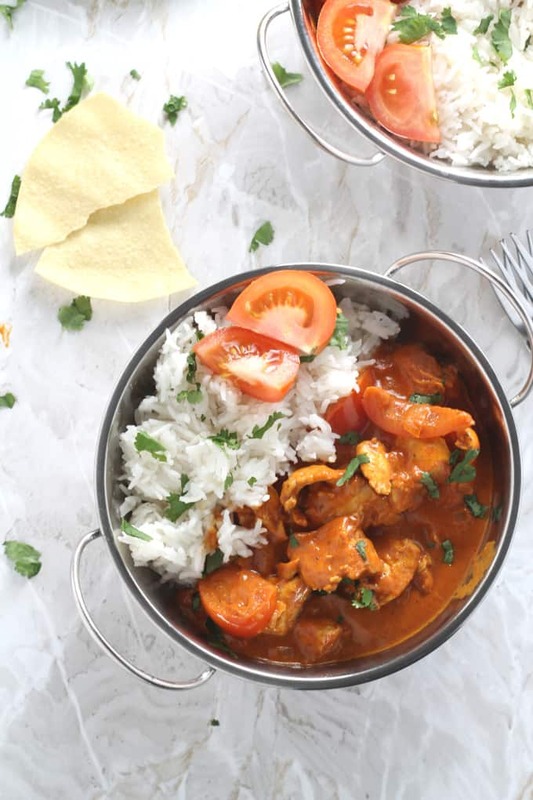 It’s quite possibly the easiest cook-from-scratch curry recipe you’ll find, using just a handful of simple ingredients. If your family isn’t a fan of spice, then don’t worry, this recipe is very mild. My 3 year old had no problem with it but for the baby I mixed the sauce with some greek yogurt, just to be sure it would be ok for his little taste buds! I used raw chicken breast pieces in this recipe but you could also use cooked chicken, ideal if you have leftovers from your Sunday roast. In this case I would simmer the cooked chicken in the sauce for about 4-5 minutes to warm it through, before adding the tomatoes. This recipe will also keep well in the fridge for up to 2 days. I often find that curries taste even better reheated the next day! I served my curry with white basmati rice and poppadoms. Naan bread would be delicious too, perfect for soaking up all that amazing creamy sauce. 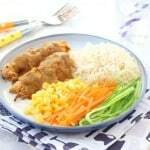 This recipe went down a storm with my family and is now a firm favourite on our meal plans. I hope you enjoy it too! Melt the coconut oil in a large saucepan over a medium heat. When melted, add the onion and fry for 2 minutes until softened. Add the garlic, ginger, garam masala and curry powder and fry for another 2 minutes, stirring continuously. Add the coconut milk and tomato paste and whisk until everything has combined. Add the diced chicken pieces and simmer for 15 minutes. Finally, add the tomatoes and continue to simmer for another 2 to 3 minutes. Serve immediately with rice and poppadoms or naan bread. A real favourite in our house, I use 2 chicken breasts and 1 can of chickpeas as my boys are only just starting to enjoy eating meat, they will try anything with chickpeas in! We have yet to find a recipe that doesn’t go down well in this house, just bought your book and app so looking forward to many more! Terrific little curry. The chicken came out really well – I was a bit neevous if not frying first – but it was succulent and juicy. Have had problems in the past with other recipes with garamasala tasting powdery and frankly awful. This recipe it worked wonderfully. I can’t wait to try more! My boys who always find curry too spicy just loved this. It’s is going on our weekly meal plan for sure everyone loved it. Yay a winner with our picky two year old plus mummy and daddy too! Thanks so much! I love all of your recipes so far. I’m yet to cook this one but wanted to ask if this could be done in a slow cooker & if so how long for? Absolutely love this curry and will definitely be making it again. I added diced carrot and spinach to mine and omitted the chopped tomatoes at the end. It was a winner with my 4 year old and my husband. Thanks for sharing. Thanks Alex. So glad you liked it! Better than anything from a jar. Super easy and fussy-friendly. I made this curry a little while ago, making it again this week. I’m excited to have it again! This is such a good recipe! I normally make it the first day for my daughter with less spice and then save the rest for my husband and I for the following day after I’ve added a bit more heat! Lovely!!! Thanks for sharing your wonderful ideas! Could I just ask if garam masala is vital or would it be ok just to add the curry? Just that Im normally not a fan of curry so don’t have those ingredients but my fussy 7 yo likes spice so thought I would try it! aid say yea. thW garam is needed for sure! But there are garam recipes everywhere. A quick Google will tell you what spices to blend and you’ll be good to go. I make this fortnightly! I’m a childminder and have yet to find a kid that doesn’t like this! I do omit the tomatoes at the end as most kids end up picking them out. I serve with rice, peas and some naan! Awesome and very tasty kids loved it! Oh my God, you’re literally my new hero. Partners kids are reluctant to try new foods as their mother is fussy and let’s them eat whatever they like,often not healthy food. 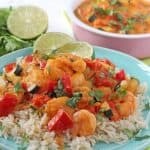 Have tried recipes in the past to encourage them to eat certain foods and this one went down a storm! You have no idea how happy I am! Oh wow thank you so much! That’s made my day! So chuffed the kids enjoyed the recipe. Hopefully you’ll find some more here that they like!! This was the first time I had cooked a curry for my children aged 4, 6 & 8. They rarely agree at meal times but this was a hit and all 3 asked for second helpings. I added chopped spinach a couple of minutes before the end of cooking time and served with short grain brown rice. I also used some tinned tomatoes instead of fresh. Wow that’s amazing! I’m so glad they all enjoyed it! Yep the tubes (or small tins) of tomato concentrate / puree / paste. This curry was a huge big hit with my husband last night, I added in roasted cauli, chilli, peas and flaked almonds and he had seconds. I’ve omitted the chilli for the kids portions but added in a layer of rice to freeze the pots today. It was extremely mild without chilli really just a strong tomato chicken dish. It needed more liquid than the recipe to give enough sauce. Thank you so much for sharing this and say a wee prayer that the kids eat it too. Not that I care becuas I’ll eat it all. Delicious curry. My 3 and 5 year old love it. This is the first recipe I’ve found to suit the whole family. Thank you very much! That’s fantastic Jo! So glad your whole family loved it! Great recipe! I added half the tomato paste and onion to accomodate my little one and it was brilliant. I’m so glad to hear that! 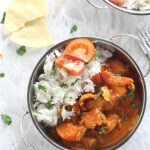 My kids love this curry too! Total hit with my toddler. One question – do leftovers freeze well? Yes I make big batches and freeze it all the time! How many chicken breasts in 600g? Can any other oil be used? Instead of coconut oil? Yeah of course, or butter too! Hello! Good job. Great recipe you have posted. I really want to try this recipe at my home. Tell me one thing, can I add some vegetables in tomato rice. I am waiting for your response. Thanks. I’ve made this twice. Tonight in a pinch I used a can of Rotel instead of fresh tomatoes because hey – it’s January. I also added chick peas and served over crispy lentil cakes I had fried in coconut oil. Next time I think I will add Spinach or serve over a plate of greens. I love this recipe so much – I was afraid of trying to make curry from scratch but this is a great place to start. Thank you! So glad you liked it Jennifer. 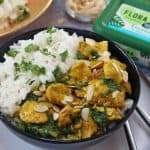 A chickpea version sounds really delicious, I’m definitely going to try that! I’ve made this recipe at least 5 times now. It’s delicious, quick, and easy! I rarely write reviews, but I had to say thank you for such a fantastic recipe! For all those thinking of trying this, know that it’s an easy recipe to add to as well. I’ve added snow peas, cauliflower, mushrooms, and tofu. I also swapped the chicken for paneer once. Delicious! Fresh cilantro and whole cashews sprinkled on top also taste amazing with this! Adding the fresh tomatoes at the end is brilliant and gives the dish it’s freshness! Better than takeout AND healthier. Thank you!! Jax thank you so much for coming back and commenting. It really means so much to me to hear that you enjoy my recipe. I love the idea of using paneer instead of chicken. I need to try this!! 17 minutes doesn’t seem like enough time to fully cook the chicken. I’m 17 and just made this for the family, everybody loved it!! So delicious and easy to follow! 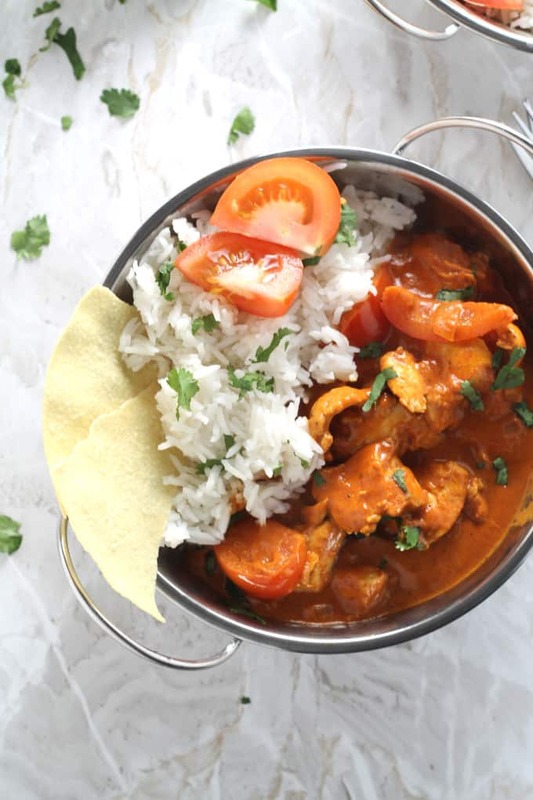 I would love to cook this meal for my family, I’m buying some balti bowls think it looks lovely in them and kids will love these, what size bowls are used I’m not sure if they are 15cm 20cm or larger? These are about 15cm. I’m not sure if you are in the UK but if you are I got mine at Poundland. Absolute bargain! This chicken curry is exactly what I need in these wet German winter days. This will be one of our family dinners this week! I hope you enjoy it Felix!